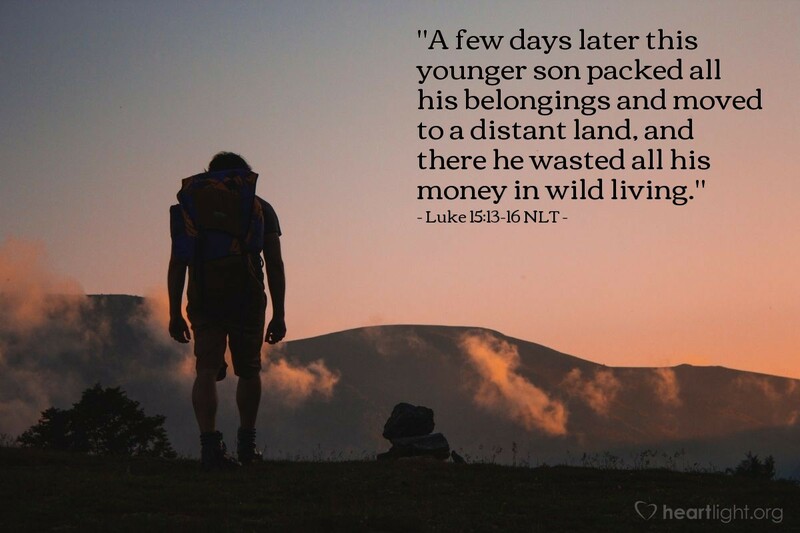 "Then the younger son gathered up all that he had and left. He traveled far away to another country. There the son wasted his money living like a fool. He spent everything that he had. Soon after that, the land became very dry, and there was no rain. There was not enough food to eat anywhere in that country. The son was hungry and needed money. So he went and got a job with one of the people of that country. The man sent the son into the fields to feed pigs. The son was so hungry that he wanted to eat the food that the pigs were eating. But no person gave him anything." Life without God is a lonely, desolate, and disgraceful place without comfort and genuine friends. While you may have companions who hang around when you have something to offer them, they are usually gone and you are often alone when hard times hit you. Those conditions are such a contrast with every picture we see of the joy and love in the father's house! Righteous God, my Heavenly Father, please help me keep my mind clear about my blessings of being in your family. Help me to see the comfort, love, and joy that are mine in your family. If I stray, please dear Lord, humble me gently and bring me back home. My heart will only find its true joy in your presence. In Jesus' name I pray. Amen.